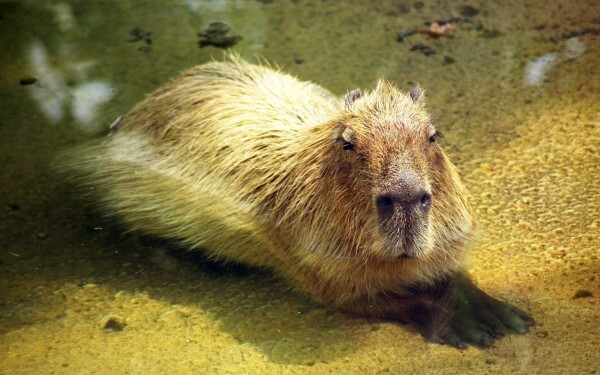 The Capybara is the world’s largest rodent species; specifically part of the Cavy family (related to the Guinea Pig). 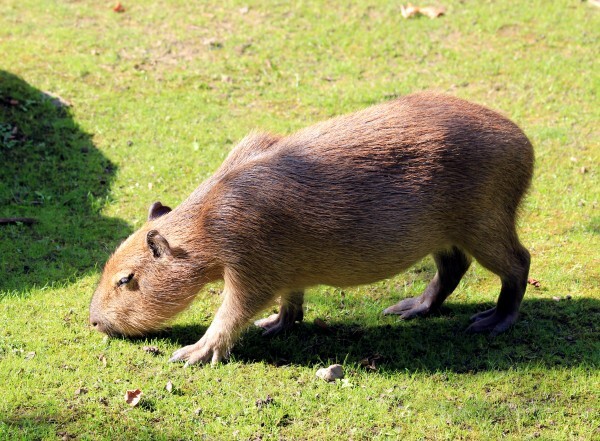 The Capybara can grow up to 4.5ft in length, and lives for 10-12 years on average. They are herbivores; eating a diet of grass, aquatic plants, fruits and berries. Like all rodents, their two front teeth (both top and bottom) are continually growing throughout their life ; this means that they must gnaw and chew food to keep them down. This large species is native to South America; inhabiting a range of tropical / temperate/ wet forests and grasslands (including the Amazon Rainforest), swamps and marshes, and lakes/ ponds. They love to spend time in water; they are excellent swimmers and can spend up to 5 minutes under the water at a time. This is advantageous for hiding in the water from predators. The Capybara can also sleep in the water, with just their noses poking out for air. Capybara’s live in groups and are quite sociable. Groups can range from 10-40; but average around 20. Within a group there is a single dominant male, with the his females (and possibly some subordinate males too). The females within the group will collectively care for all of the young. A Capybara can have between 1-6 pups in a litter; with gestation (pregnacy) lasting only 5 months. 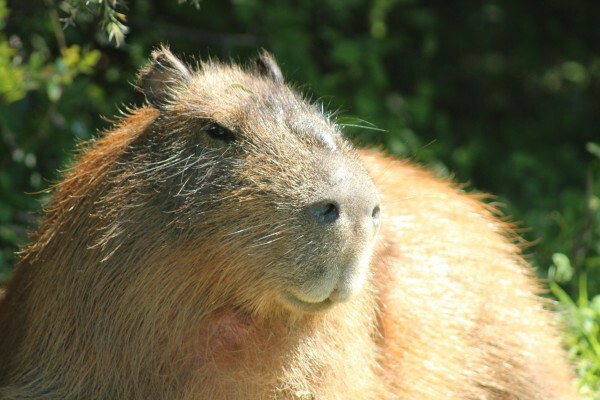 The Capybara is a thriving species, and though is hunted for food and other uses by humans, they are not endangered (however hunting is restricted to help ensure the longevity of this species for the future). They are commonly found in zoos all over the world, so you can see this amazing creature for yourself!